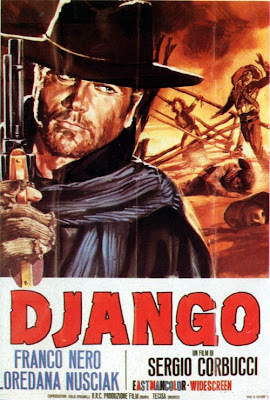 Django (Franco Nero) is mysterious drifter who drags a small coffin behind him wherever he goes. During his travels, he rescues a young beauty named Maria (Loredana Nusciak) from a decidedly cruel fate. By doing so, he draws the ire of the sadistic Major Jackson (Eduardo Fajardo). He then adds insult to injury by striking a lucrative deal with General Hugo Rodriguez, a major enemy of Jackson’s. Having wandered into the middle of a warzone, this violent nomad has chosen a side. However, he will soon find that true allies are few and far between in the Old West. Django is the immensely popular spaghetti western from Filmmaker Sergio Corbucci. It’s also the most obvious inspiration behind Quentin Tarantino’s Django Unchained. However, its considerable influence encompasses much more than that. Following its release in 1966, the film not only attained a worldwide cult following, but even spawned it’s very own subgenre. To date, there have been over 30 films that have included the name “Django” in their title. The vast majority of them are in no way related to the original. Tarantino’s latest offering is now a part of that fraternity. While a small portion of these films may actually be good in their own right, Sergio Corbucci’s remains in a class by itself. Django was released two years before another Corbucci masterpiece, The Great Silence. Watching the two films back-to-back reveals something of an evolution on the part of the filmmaker in question. Doing so also reveals him to be aesthetically varied, at least to a degree. The Great Silence takes place amidst the Great Blizzard of 1899. In that film, the fictional town of Snow Hill, Utah, might as well be the ice planet of Hoth from The Empire Strikes Back. In many regards, Django occupies the other end of the visual spectrum, as it wallows around in the proverbial muck. Practically every inch of ground in the film is covered in mud, which the characters trudge through as though it were the most natural thing in the world. This is a film in which the actors clearly weren’t afraid to get their hands, among other things, very dirty. Django’s level of violence was unparalleled for its time, making it highly controversial in many quarters. The shootouts are not only frequent, but quite bloody. The bloodletting isn’t just limited to gunplay, as whippings, fistfights, and maimings are also shown. Of course, all of the aforementioned carnage is rendered in a patently melodramatic style that emphasizes the horror of man’s inhumanity to man. Nevertheless, there is a distinct air of unreality. The stage blood used has the color and consistency of bright red paint. Even when a fresh wound is shown, blood never sprays or oozes out. It’s merely caked on, and often looks as though it’s been allowed to dry for a bit before going in front of the camera. The considerable influence of Django extends well beyond its more obvious imitators. It even reaches beyond the boundaries of both traditional and “spaghetti” westerns. In Perry Henzell’s landmark 1972 Jamaican crime film The Harder They Come, an audience at Kingston’s Rialto Movie Theater is shown watching Django just as it’s infamous “Gatling gun massacre” is about to commence. The cruel fate that befalls Chi-Hao in the 1972 Shaw Brothers classic King Boxer aka Five Fingers of Death is identical to Django’s punishment for crossing General Rodriguez. Speaking of excruciating torture scenes, the inspiration for one such moment in Quentin Tarantino’s debut feature Reservoir Dogs also has its basis Django. 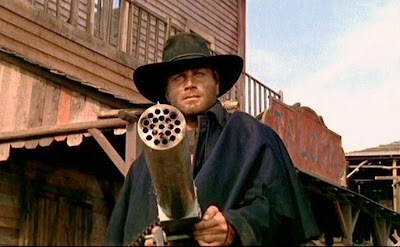 Django (Franco Nero) wielding a primitive Gatling gun. For all of its considerable merits, Django is essentially a B-Movie, albeit an inventive one. Its mission is to entertain by any means necessary. It manages to do so in spades. It also retains its ability to shock after all these years. Less seasoned film buffs who think they have a handle on the genre because they’ve seen Leone’s Dollars trilogy multiple times will surely be taken aback by some of the film’s excesses. It reveals the world of the spaghetti western to be a strange yet vaguely familiar land, where certain tropes are subverted while others are dismissed entirely.